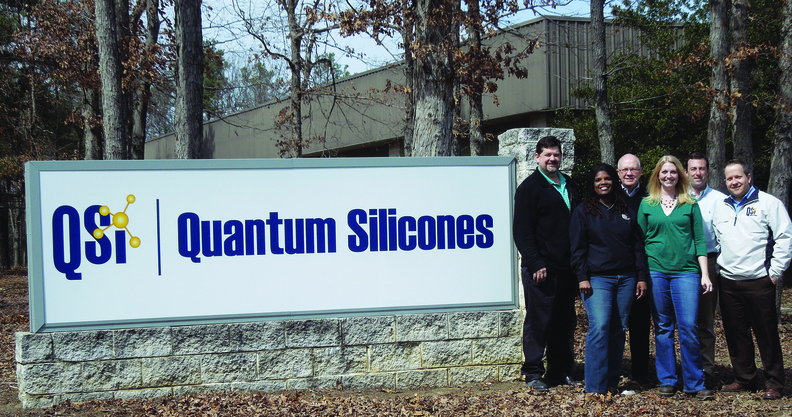 Quantum Silicones' Phil McDermott (left), vice president of technology; Linda Butler, assistant controller; Tom Loman, president; Anna Clark, business quality manager/safety director; Chris Douglas, operations manager; and Matt Loman, sales manager, gather outside the firm's new headquarters facility. CHESTERFIELD, Va.—Quantum Silicones L.L.C. has kept pace with its growing business not only by expanding its line of products, but also by buying a new headquarters and warehouse building to free up manufacturing space in its current facility. The new, 70,000 sq.-ft. facility culminates a 12-to-18-month project, according to Phil McDermott, vice president of technology for the silicone elastomer materials supplier. It will serve as the company's headquarters and warehouse. Financial details of the project were not available. "The office area was totally redone," McDermott said. "To meet code, we had to make significant investments in (the warehouse) because we are a chemical manufacturer." Quantum Silicones' warehouse is fully operational; the company will move into the office section within a few weeks. The former plant now will operate exclusively as a manufacturing and technical factory. The facility sits about a few hundred feet away from the existing 27,000-sq.-ft. facility in Chesterfield, which has been redone to meet the company's standards and needs, the firm said. With the extra space, Quantum has added new equipment to its plant, including a 700 gallon, hydro-clear Myers mixer that will complement seven high-shear mixers that range from 120 to 660 gallons. "It was something that was needed to meet our demand," McDermott said. "That new mixer not only gives us the ability to meet that demand, but the flexibility in the types of products we can supply for the market." Quantum offers a wide selection of silicone elastomer products, mold making, potting and encapsulating, silicone gels, coatings, and additional specialty product enhancers. McDermott said the company has unveiled 40 new products within the last two years. "We really partner with our customers, and we help them," he said. "We're also looking at next-generation materials and constantly asking how we can get you to where you see your business needs going, or where you're going." Quantum Silicones may add more machinery to the facility; however, that depends on future projects. The firm said its revenues have grown 37.5 percent over the last two years, but didn't release exact sales figures. McDermott said growth in almost every sector has helped drive the firm's success, but two specific markets stand out. "Probably our biggest growth would be in electronics and industrial (segments)," he said. "But our other segments have grown as well." The work force, which stands at 38, has grown to meet that demand, and McDermott said the company expects to add a few more throughout the year. McDermott and Quantum Silicones President Tom Loman founded the firm in 1997. It has been part of the United Kingdom's Amber Chemical Group Ltd. since mid-1999.